I'm currently studying Japanese language and I'll post learning tips, funny facts about Japan and well almost anything about Japan and Japanese culture. This what your Moodymaniac's Japan Corner Blog Ad will look like to visitors! Of course you will want to use keywords and ad targeting to get the most out of your ad campaign! So purchase an ad space today before there all gone! Anime of the Month: Durarara!! This was big hit in 2010. I really like this song. It reminds me of a person who was like a grandmother to me. 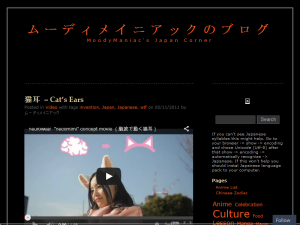 If you are the owner of Moodymaniac's Japan Corner, or someone who enjoys this blog why not upgrade it to a Featured Listing or Permanent Listing?